This is a 16GB hand made custom usb flash drive. It is created from a relatively rare and beautiful exotic wood called 'zebrano'. 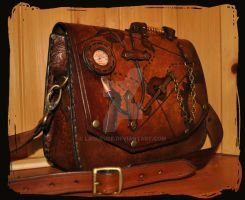 The top side has been decorated with recycled watch parts, it comes complete with a wooden lid, brass face plate and pocket watch chain. When plugged in the key glows red underneath the gears. All the watch parts have come from damaged or irreparable pocket watch's that have been hand disassembled and then combined to create a true, miniature work of art. That is indeed a beautiful sort of wood! good idea , beautiful work ! i SOO want of these! it's not only beautiful but functional. It's so steampunk. Absolutely beautiful. hey can you make a pocket watch that plays a melody? Its ugly for me ._. never thought i'd say this about a flash drive, but beautiful. Some day, I will get meself one of those. Great work, by the way. It would be epic if the gears turned when you plugged it in. If only you could put a tiny electric motor powered by usb so that the gears all turn while its being used. This is amazing. I will buy it. It's so historical looking yet, a piece of technology! man i would so buy that. but idk if i would want to use it in fear of breaking it. i would still be worried lol its to awesome to skuff!! Shame that the wheels and cogs don't spin when it's plugged in, but that would be really hard to pull off. My level of sanity is already limited, but I don;t think I;m at risk of a receding hairline... I have way too much hair. Dteampunk awesomeness! Want one so bad! very sweet steampunk! Reminds me of my pocket watches! Glad to see the reused parts. I don't recycle too much. I do tend to reuse items. I do enjoy seeing what others do.